Tinytags monitor energy performance in new and refurbished buildings to help provide essential data concerning the success of energy saving initiatives and technologies. The Black Country Housing Group is a housing association that serves local communities in Birmingham and the Black Country, providing affordable housing for rent, new homes for sale and a diverse range of specialist local services. Richard Baines, the Group's Director of Sustainable Development, provides environmental consultancy services in-house and also to external fee-paying clients. Richard has been using Tinytags for many years as part of this service, to help evaluate the performance of energy saving measures. The energy performance of new or modified buildings is monitored to establish the value of new technologies. Monitoring is an essential tool in the evaluation of innovations which have to meet stated performance expectations. Up to ten Tinytag Ultra 2, and Tinytag Talk 2 temperature and relative humidity loggers are deployed, and the recorded data is analysed to establish whether performance is in line with expectations, or to help identify unexpected performance (better or worse). Improvements can be publicised, whilst any problems are identified, investigated and solved. Richard chose Tinytags because they are stand-alone and unobtrusive in occupied dwellings. He adds, "Previous products from other suppliers proved ineffective. Over several decades now, the Tinytag brand has proved to be bullet-proof!" 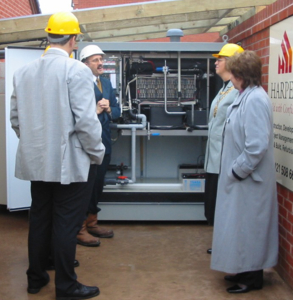 Image: Switching on the World's First Hydrogen Fuel Cell CHP System: Tinytags helped evaluate the performance of the world's first Hydrogen fuel cell Combined Heat and Power (CHP) for social housing in Blackheath, West Midlands.